Thanos by Donnie Cates has been a hit for Marvel. In large part the success is due to the introduction of the Cosmic Ghost Rider in Thanos #13 (available on eBay) . The 1:25 Variant on eBay is going for crazy money, especially in 9.8 graded. A while back we mentioned Guardians of the Galaxy #13 (available on eBay) , which has a cosmic Ghost Rider on the cover, not saying it was the same one, but it is a cosmic Ghost Rider. Tonight, we are showing off another version of the Cosmic Ghost Rider. If you didn’t catch the spoilers we posted for Thanos #15 (available on eBay) , it was revealed that the Cosmic Ghost Rider was none other than Frank Castle, the Punisher. But what if a Ghost Rider/Punisher mashup happened before his appearance in Thanos? 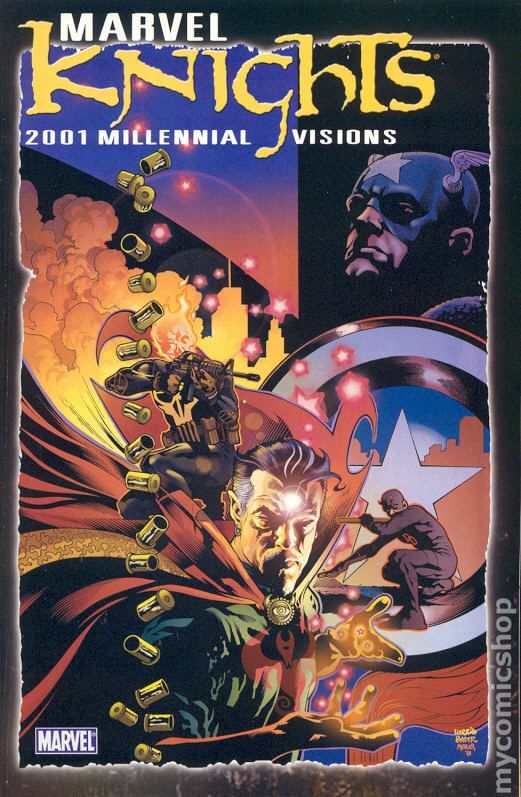 Well, we got one on the cover of Marvel Knights Millennial Visions (available on eBay) . As seen below, and only appearing on the cover, is Frank Castle Punisher with a flaming Ghost Rider head. Thanos #16 (available on eBay) gives us the origins of Cosmic Ghost Rider, and from preview images in the book, we will see images similar to what is on the cover. So if you are out back issue hunting this weekend, be on the look out. No Just on the cover. I do have copy of the book. Wow that is just flat out weird, especially given his long ago that was and how they never did anything with that until now. It was pretty random at the time. Did Cates look at this cover and say hey this gives me an idea? I doubt it. Credit given, however, since I don’t read the site, nor was that ever pointed out, I was not aware of it. However it was published first. Tip of the hat to you Gabe. Topher, was this one of your original posts? If so kudos. I did not see the article until it was pointed out and discovered the book by doing a ebay search for first cosmic ghost rider. Sadly, so many articles are put out and I don’t read many of them. I don’t read cbsi, so it was coincidental, but I am always willing to give a nod to someone else who had it first.